Danfotech offers a cleaner, more efficient way to defrost frozen blocks with an innovative system that minimizes labor and space. The modular design makes the defrosting system expandable to meet your production requirements. Until now, defrosting frozen meat blocks involved exposing the product to running water, hot air, steam or microwave tunnels and the results were far from perfect. Compared to traditional defrosting systems methods, the Danfotech Defrost system gives you an additional finished product instead of loss caused by dripping or overheating of the product. The result is a natural-looking defrosted product attained with this revolutionary controlled heating and cooling process. 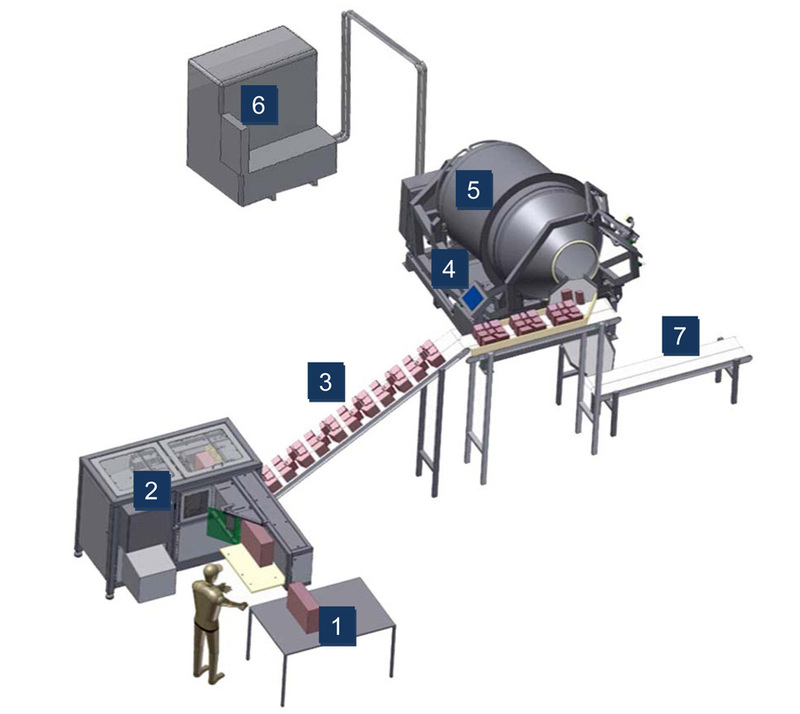 Frozen blocks in the 0° to 10° F (-18° to -12° C) temperature range, depending on product, are placed on a conveyor and pass through a meat block divider. The blocks are pressed and separated into individual muscles without damaging the fibers or membranes. This results in more consistent batches in terms of temperature and appearance. The separated blocks discharge onto a conveyor that transports them to tumblers for defrosting. After defrosting, the product can be directly transferred for tenderizing, injecting or other further processing. •	Flavor, salt and protein drip loss of 5% to 8%. •	50% to 55% fill degree reduces requirement for additional tumbler investment/capacity. •	Processing times of up to 3 batches per 24 hours, including sanitation. •	Non-separated meat blocks only allow 30 to 35% filling of tumbler. Download the PDF brochure to learn more about the Danfotech Defrosting System.